On June 19 at Gaithersburg High School, the Community Foundation for the National Capital Region and Identity presented the findings of a research study that identifies the main reasons that increase the likelihood of disconnection from school and ultimately workforce entry opportunities. What are the predictors of disconnection from the school system? What are the predictors of disconnection from the labor market? What are the needs and assets of disconnected Latino youth and Latino youth on the verge of disconnection in Montgomery County? Latinos represent about one-fifth of the population of Montgomery County, however the dropout rate among Latinos is almost 15% higher than it is for white non-Hispanic students. The main reason for youth disconnection is low educational attainment, which only increases the indicators of poverty in the county. The Community Foundation suggests that long-term success for the Latino community in the county needs to undergo a positive change across a broad mix of youth and adult-serving agencies, nonprofits, funders, and institutions. The first recommendation proposed by the project to tackle this issue is a liaison between Montgomery County Public Schools (MCPS) and the community, along with other stakeholders in order to develop action plans that would lower the Latino dropout rate and close the achievement gap. For example, youth in the survey that reported low expectations from their teachers and their counselors were more than 3.5 times more likely to drop out of school. One way MCPS could improve this issue is by providing academic support and intervention for students with a grade point average below 3.0. The second recommendation is to improve workforce development efforts for students in school and those who are not in school but lack the work-ready skills. In order to improve this, the study recommends more career coaching and exploration programs, internships, and an increase in youth awareness of said programs. The third recommendation is to improve the opportunities for members of the community, especially parents, to increase their civic engagement and become more involved in their children’s education. In order to change this, the organization proposed mapping out civic engagement in the community and creating more opportunities for parents. When it comes to predicting when a student might disconnect from the school system, the study found that foreign-born youth were over 1.5 times as likely to report being dropouts compared to American born youth. Youth who reported having been pregnant or had become a parent were almost 3 times as likely to report being dropouts. Youth who reported having been arrested were almost 2 times as likely to report being dropouts as youth who had never been arrested. Those students with GPAs of 2.5 or lower were over 5 times as likely to report being dropouts than students with a 3.0 or higher during their senior year of high school. Repeating a school year also accounted for almost 3 times as likely to report being a dropout. Other factors such as not speaking English well in school, low parent expectations and absence of connections heavily accounted for student disconnection. The problem with being a school dropout is that it stays with a student for life. Identity’s survey results predict a grim future of employment opportunities for Latino youth. Seventy-seven percent of the high school dropouts in the survey had never received any job training. Even among the high school graduates who were not employed, the percentage that had never received any type of job training was closed to 62%. Among the most common reasons Latinos reported having been fired from a job were: missing workdays, fighting with a supervisor, and criminal charges. The most common reasons for quitting included: dissatisfaction with a co-worker or supervisor, lack of interest, having to take care of the household and salary discontent. This is a step in the right direction to improve academic opportunities for the Latino community in Montgomery County, and can set a precedent at a national level! Stay informed. There is simply no better way to introduce our guest except through his Twitter handle @OLPL as that is how I met him and that is the medium through which his voice is heard across the world. Orlando Luis Pardo Lazo explained on Generacion Latina the reality of being a citizen journalist/blogger in today’s repressive Cuban regime calling it “paternalistic”. He described all the challenges Cubans face as they seek to join the digital age and access freedom of information. Whether it is the high cost of internet access, the carefully-placed boundaries on professionals when navigating the internet, or living under constant surveillance, this interview gave us insight into the dark digital world in which Cubans live in and their urgent need for internet freedom. If you care about eliminating disparities in the Latino community, among many issues, health should be at the top of your list. But does oral health even cross your mind? If not, I don’t blame you. However, the “oral health” reality for Latinos in the US is that approximately 45% of them lack dental insurance. Learn more about the work of the HDA through its service, advocacy, education and leadership. Plus, they are now in Washington DC! Make your foreign education count in the U.S.! The program will feature a panel of experts who will provide information and resources to help skilled immigrants pursue further education, obtain professional licensing or certification, and find suitable employment in the U.S. Courtesy of Karla Silvertre of Latino Liaison to the County Executive, Office of Community Partnerships &anager of the Gilchrist Center for Cultural Diversity and Montgomery County and Montgomery College, an academic institution that is committed to equal opportunity and fostering diversity among its student body, faculty & staff. Calling all Hispanic Dental Students! 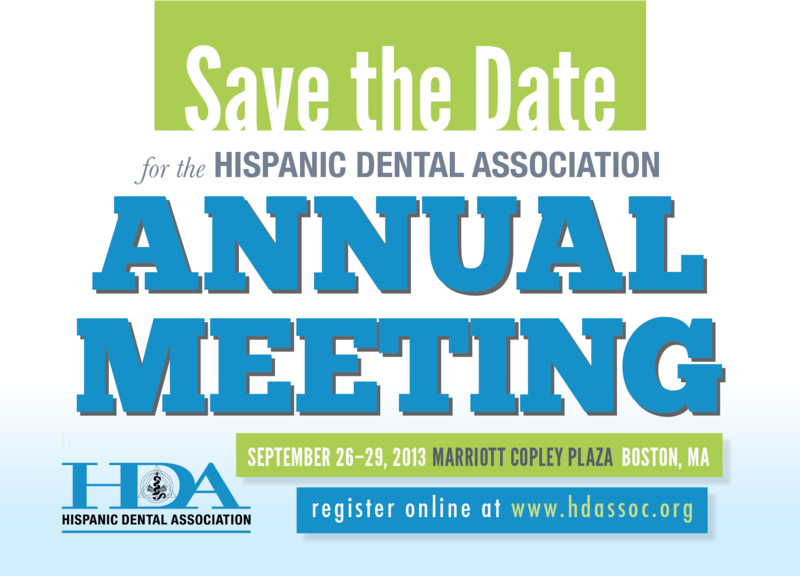 If you are a Hispanic dental student, consider adding this to your calendar! 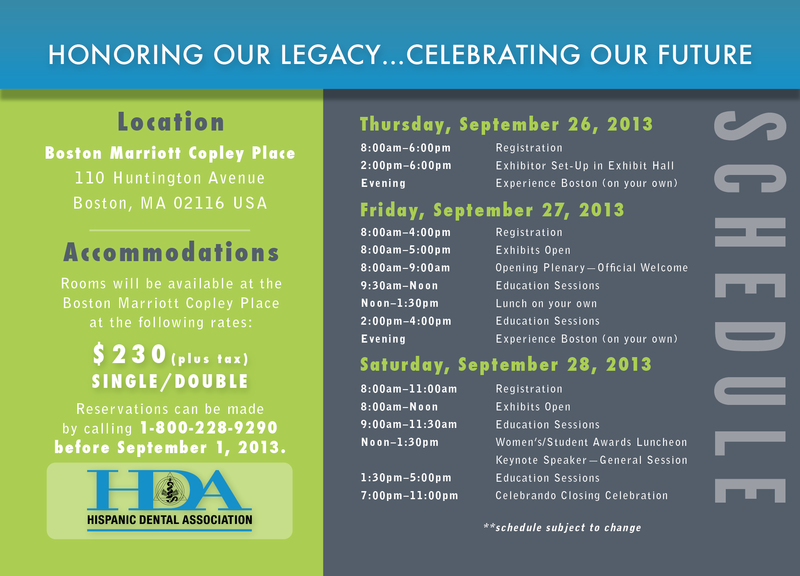 Hispanic Dental Association’s Annual Meeting in Boston will be here before you know it! Check out their site for more info: http://www.hdassoc.org or the details below for the largest gathering of Hispanic oral health professionals in the country. 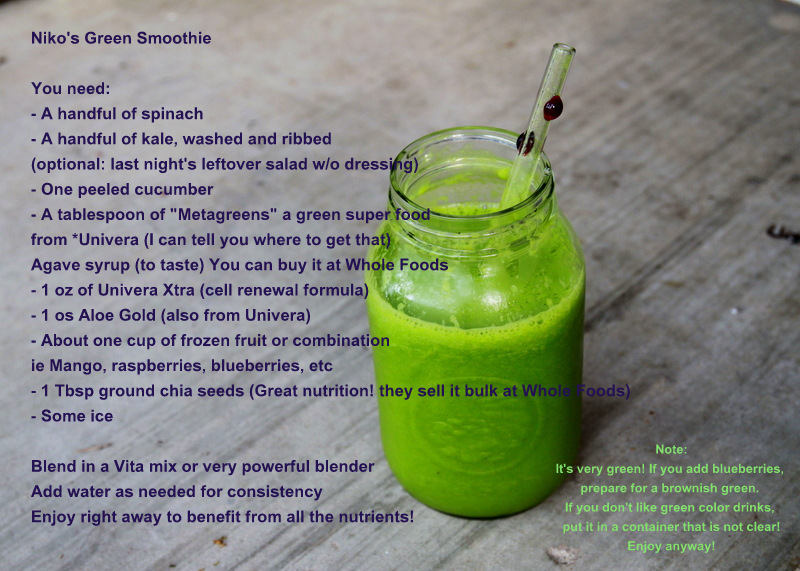 As promised, here is Niko’s SUPER GREEN Smoothie! Prepare for a nutrient-packed drink that could take your health to the next level. If you try it, let us know if you liked it! *Univera- these ingredients can be purchased via independent consultants. If you don’t know any, Niko does! Just ask us here or contact us via Twitter: @CarolinaPena. With this show, we begin a series on Wellbeing starting with our bodies. Truth is, most of us are not at our optimum best because of our lack of nutrients and exercise. Our community is plagued by obesity and diabetes yet we continue in our habits on to a slow death. Enter Niko (lost 45 lbs. in 3 months) & Eduardo (formerly weighing over 200 lbs.). Watch their personal journey to becoming fit by changing the way they live taking one step at a time. Did you know children are being abducted into war and forced to kill their parents and terrorize others? If you didn’t know, I hope you take a few minutes to consider the work of Invisible Children and get involved because they are coming to DC THIS SATURDAY NOV 17!! It is called MOVE DC. It involves youth, like YOU. It will show world leaders that we want them to capture Kony and stop the killings once and for all. We can bring an end to this war. Now, what are you waiting for? Come out to DC this Saturday Nov. 17. Wear the KONY shirt or make it at home. And finish off a historic day of advocacy with a huge dance party. At a friends gathering, I met Leo, Steven, and Nick. They were triplets and blind since birth. In less than a minute of conversation, they immediately talked about their dad. And they talked a lot! The way a five year old talks about his shiny new super hero. Moments later I met Ollie, a lawyer and former service member whose heart for the boys was bigger than anything he’d felt before they crossed his path. Their drive to make the most out of each day is simply unstoppable. They have met with numerous elected officials in Virginia to advocate for better pay for Braill teachers and succeeded when legislation turned in the teacher’s favor! If your favorite subjects are Math and Science, check out this unique summer opportunity at NO COST. The (MS)2 program is looking for minority youth to be a part of a month-long summer program in Massachusetts. But you need to apply by November 7th, 2012 if you want to be considered! Want to go to outer space? Maybe you can start by interning at NASA! NASA’s 2013 internship program is taking applications! If discovery and science slightly interest you, take a quick look! – Students in undergrad or grad school pursuing degrees in the sciences, technology, engineering, mathematics, business, communications, or education disciplines. That’s pretty broad you guys!! Que esperas? Solicita ya & SHARE with your friends! Ayuda te ayuda. Deferred Action workshop on 8/20! 9th & 10th Graders- Register Today! Are you enrolled in Montgomery College and could use $1000 or more to finance your studies? Check out this scholarship by the Woman’s Bar Foundation, Inc. This opportunity is available to all Hispanic students, with or without documents. JSA is out! But the work is not done. As of this moment I am logging into my Facebook to find countless videos, messages and friend requests. It is rather ironic to think that last Friday I was laying in a maximum security cell along with my father. However, today I find myself tasting freedom and seeing my face on everyones Facebook. In moments like these one realizes that nothing is impossible when one abides by their goals and maintains determined. I would like to directly state that at first I found myself overwhelmed, however as the days settle i realize that this is perhaps the biggest thing that has ever happened to me and everyone around me. With this said, I need to let everyone know that this movement does not stop with simply getting me and my family out of jail, this movement is the beginning of something bigger that will benefit others in my same situation. Now as mentioned previously this movement is not Jorge Steven Acuna anymore, this movement is now targeting Justice for Students in America. With that said i challenge each and everyone out there to fully support this movement because there is no stopping us now, if JSA was able to free a family out of jail in four days JSA is capable of forever defending the youth from injustices. I want to invite everyone to rally on August 4th to demonstrate the world that together the youth can change laws, make change, and dream big. By creating a movement that is in the heart of the most powerful nation’s capital, we will represent the youth at an international level. I challenge each and everyone of you to not stop now but to begin working harder, this movement will benefit the lives of all the unrepresented youth, and the youth that just like me has huge dreams. On a final note i would like to say thank you one more time, but i would like to challenge everyone to work harder, because we are not worth simply one family but all the American youth. Thank you each and everyone of you for everything you have done for me. Help me carry on this movement with your support, ideas, and determination to make this the biggest youth movement this country has seen. Let the youth make a difference, let the youth have a voice, let #JSA be the difference that everyone has been waiting for. This is our time to make a difference. 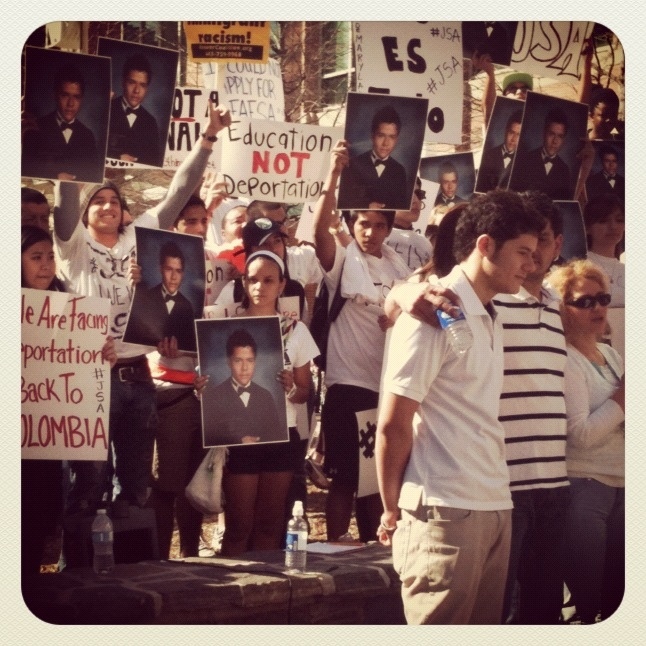 Montgomery County Latino youth make history. In this picture: Jorge Steven Acuña, his father and mother. Here is a short clip from Sebastian Roa, one of the leaders of this movement. Home at last. The Acuñas are home at last. After the efforts of Montgomery County young adults reached media and politicians, Northwest alumnus and Montgomery College student Jorge Steven Acuña, along with his parents, was released from Snow Hill Detention Center. What started out in Rodolfo Espinoza’s basement soon became a trending topic around the county, literally. #JSA quickly flooded timelines as high school and college students took to their social networks to spread the word about this injustice. Soon after, Julio Castillo created the Facebook group that allowed strangers to come together for a common cause; the group garnered more than 1,500 members in a matter of days. Newsfeeds exploded with links to http://www.change.org/petitions/jsa. The link “changed” just yesterday to www.lethimstay.net, when David Moon purchased an URL to help make it easier to get the word around. And the word sure got around, to more than 6,000 people, as of March 13th, 2012. Cars were painted, shirts were made, phones were dialed, interviews were taking place, videos were produced, meetings were occurring, flyer were distributed, sidewalks were chalked up and strangers were becoming friends. The power that this effort obtained in days is surreal. We must not forget that even though our primary goal has been accomplished, we still have a long way to go. With the momentum we have reached, we must continue to fight for Jorge and his family, to obtain legal status. Moreover, we must use the impact we have right now to bring light to this issue, an issue that affects many promising lives… We must be their voice. We can make a difference. We can promote change. We already have proved that. So, why stop now? This is just the beginning. The sentiments of this effort are as pure-hearted as they come. To Jorge’s family, to his close friends, to everyone and anyone who did anything to make Jorge come back home… THANK YOU! Don’t take our democracy for granted! Come out and get your voice heard by your congressional REPRESENTATIVE. Correct- he represents YOU and YOUR interests in Congress! WHO: US Congressman Chris Van Hollen To Speak March 13 7 PM in Silver Spring. He presents “The State of Congress”. WHEN: Tuesday, March 13. Doors open at 7:00 p.m. Spread the word to your friends and fellow constituents in Congressional District 8! It’s your chance to meet him in person and ask questions you want to have answered. Gianna is not your typical high school student and that is why at Generacion Latina, we LOVED her! That means you can’t miss this interview- this weekend on channel 16 at 10pm (MMC-TV) and coming soon on our YouTube channel. During our interview she covered her passions, hobbies and unwavering dedication to academic achievement. More importantly, for a scholarship-winning student like herself, her ability to balance life between school-work-internship-blogging is truly inspiring! Get to know her and listen in on her strategies for success this weekend on Generacion Latina. 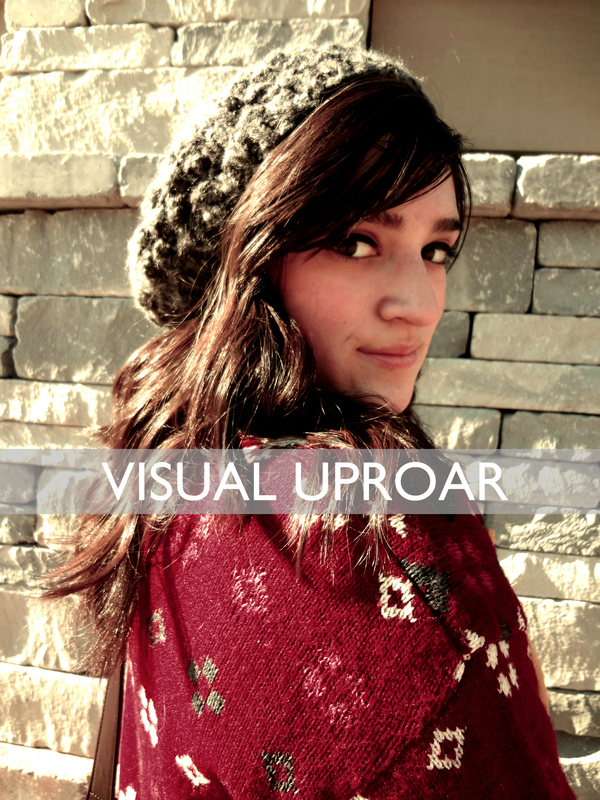 What caught our interest, besides the academic ambition and love for teaching is her fashion-based blog. This young lady instigates some serious Visual Uproar. This is what she wore to our interview. Enjoy more photos and check out her Facebook page for her blog too! Would you cycle across the country for a cause? Maybe you won’t, but Gia is! When my friend Gia told me she would cycling from Baltimore to Seattle over the summer, I thought what you are probably thinking right now: CRAZY! But love drives us to do crazy things. Gia’s love for her sister is fueling her goal to make it cross country on a bike to raise funds for cancer research and awareness. Read more about her story here and PLEASE support her. Even $10 or $25 will help her make the goal. This month we begin a special feature of an MCPS student who positively represents who we are as young Latinos, breaking the stereotypes we typically see in media. There is no “one-size fits all” when it comes to Latinos, and each month we hope to highlight our diversity of race, dreams, accomplishment and Latinidad. For me, being a Latino in America means helping bring up a generation that exceeds typical stereotypes of underachievement or incapability and to represent Latino communities throughout the United States, showing the impact and potential we have to influence ourselves and the people around us for the better. While the Latino population has the lowest graduation and achievement rates, I don’t think that we should have that image or title as the lowest achievers. I see a responsibility to serve as an example that shows there are Latinos are doing something and show the good things we can do and what we can reach. What keeps me going everyday is knowing that all I’m working for right now is what will result in as my future. I’ve learned and heard from many leaders that many do not think proactively or “into the future” about what results and consequences their actions will bring and that it is difficult to have a long-term perspective on things. But what gives me motivation to work everyday is knowing that accomplishment can be reached by putting effort in the things I do and disciplining myself, knowing that there is potential for me to let unravel if I simply prepare and train myself. The greatest challenge/problem for Latino youth is breaking out of the stereotypes on the Latino community being looked upon as underachievers. In schools, Latinos students are predominantly the ethnic group with the lowest SAT scores and grade point averages. The Latino youth has struggled with building an education-based life. Many Latino students slack in school and do not value their education as a priority to have a successful life. Lack of self-motivation, self-discipline, and dedication is a major issue in many Latino students. My biggest dream is to make a difference in the lives of as many people as I can politically, academically, and as many aspects as possible. My main goal and hope is to see the Latino community rise out of the undermined stereotypes of underachievement in schools. Where we won’t be looked down upon, but rather looked up to. And that it get to the point where we are looked for to make the decisions that affect us all. I wish that in some way I could leave a legacy for my family and everyone else to follow to make a difference for the better of us all. Before dying, I would like to travel to different countries. I don’t want to stay sort of boxed in the United States making it all I know. I would like to get to witness personally different countries and learn more about them. The reality is that there are a lot more out in the world to be known, and I don’t want to stay within the boundaries of what is familiar to me. America is frequently described as a mixture of many races, cultures, and backgrounds so visiting different countries where those aspects originated from would give me so much insight of our backgrounds. And finally, I just would love to have the opportunity to see how other people around the world live. Education is important for me because in this world we live in, education is what gives individuals, minorities or higher class, the edge on reaching success and having a good life. Having a higher education, and having exceptional academic achievement increases the chance of an individual going to a good school, and if they continue their good achievement, they may have a higher chance of getting chosen for the best jobs. And most likely that trend of high achievement will continue throughout their career and the rest of their life. Another reason why I think education is important is because education is knowledge about the world we live in, about how it works, what happens in it and what has happened, and can help us further discover the world. Without an education, many would live in ignorance about the place they live in. Having an education is a huge benefit and cornerstone for all individuals. Goodbye resolutions. Hello new habits. You’ve heard it once, twice; a million times: New Year, new you. But, how do we follow through? Simple. By giving our goals an opportunity, for 21 days. Whether you want to shed a few pounds, get your GPA up, or everything else in between. This past year we came across some excellent tips to get serious about achieving goals. But we won’t call them goals or resolutions. In 2012 we are going to build new habits! But we disagree with Matt. What?! Yes, you heard it right. We disagree and think that 21 (not 30 days) is the magic number. Look it up! It takes 21 days to build a habit. Be realistic. You’re not going to lose weight by sitting on the couch all afternoon; you’re not going to get your GPA up to a 4.0 overnight. Start small. Maybe it’s: stop biting your nails or read and meditate for 15 minutes a day or shower in half the time and waste less water in 21 days. Start now; give yourself something to look forward to. Attract whatever you can this month for an unforgettable year, make this YOUR year. You can do whatever you set your mind to; all you have to do is make an attempt. It won’t be easy, but it certainly won’t be impossible… Break a habit, make a change. Improve your lifestyle. You won’t regret it, that’s a promise! Te interesa estudiar en Montgomery College? Quisieras ahorrar el costo de la solicitud? Ven a la reunión informativa en el Student Services Building ubicado en Takoma Park/Silver Spring este Miércoles 7 de Diciembre a las 5:30pm y ahorre $25 al someter tu solicitud. Para mas información, contacte a Gloria Bonilla al (240) 567-3961. After this Sunday’s premiere of of “The Road to Strathmore” Documentary at AFI, the hype is up and the 12th Annual Latin Dance Competition for MCPS is ON! You won’t want to miss this so invite your friends and family to witness young Latino dancers take it up a notch (or two) at none other than the prestigious Strathmore stage. For the second consecutive year, students will face each other and leave their souls on stage as they compete in eight different divisions. After countless hours of practice, emotional highs and lows, eight teams representing MCPS high schools, parents and alumni will gather for a night that promises to exceed all expectations. THIS FRIDAY: Technology Seminar for Students- RSVP ASAP! 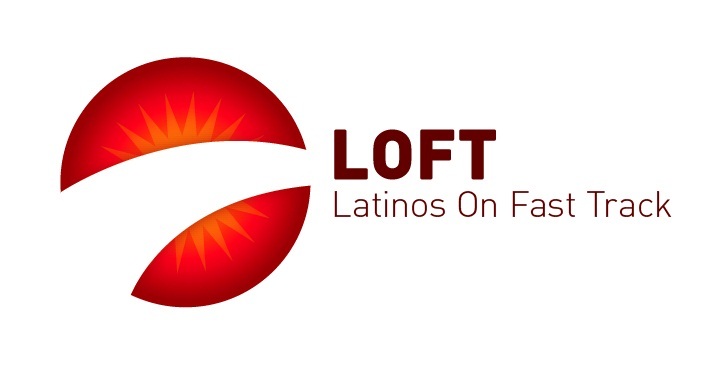 The Hispanic Heritage Foundation’s LOFT Institute in partnership with AT&T, cordially invite you to the 2011 LOFT Technology Seminar on Friday, November 18th, 2011. This is an exciting opportunity for LOFT members, in high school and college, to network with AT&T professionals and learn about the diverse career opportunities available within the Technology Industry. Come prepared to engage in a dynamic dialogue led by Latino and minority leaders in Marketing, Public Affairs and of course, Technology. A tour of AT&T’s Innovation Center will follow the discussion. Seating is limited, please RSVP promptly at the following link: http://bit.ly/pDHH3J Attendees will receive an event confirmation via email. Dress code: business casual. Lunch will be provided. *Sessions marked with an * will be live broad-casted from the NYC Innovation Center. If you decide to apply for a position, be sure to list LOFT as your reference. The intern will assist with financial and business process control audits performed throughout the Company. Financial/operational audit assignments would likely include the review of controls and procedures in place within manufacturing facilities, finished goods warehouses, and business processes such as procurement, trade promotion spending, credit and accounts receivable and cash management. The candidate would work extensively with SAP and other information technology systems utilized by the Company. Spring/Summer 2012. The Business Applications Development Intern will participate in support, development, and testing of web based applications using emerging technology platforms from IBM, Business Objects, SAP and Adobe. The student will collaborate with IT colleagues to document user requirements, and participate in the solution development and testing. Technologies utilized include Java, Web services, .Net, Web 2.0, and Adobe Flash. Spring/Summer 2012. The Client Technologies Intern/Co-Op will participate in support, development, and testing of web based applications using emerging technology platforms from IBM, Business Objects, SAP and Adobe. The student will collaborate with IT colleagues to document user requirements, and participate in the solution development and testing. Technologies utilized include Java, Web services, .Net, Web 2.0, and Adobe Flash. Spring/Summer 2012. The student, under direct supervision, will participate in support of SAP infrastructure applications using existing and emerging technology platforms. The student will collaborate with IT colleagues to understand and document SAP Basis and Security processes and procedures, and perform routine tasks required to support technical system administration of the SAP landscape. Landscapes cover the Manufacturing, Supply Chain, Finance, Marketing, Sales and HR application areas. Spring/Summer 2012. The student, under direct supervision, will participate in the support, development, testing and deployment of server infrastructure. The student will collaborate with IT colleagues to resolve operational issues, deploy hardware, troubleshoot and recommend solutions, handle user issues, deploy operating system patches, complete file backups and restores as well as participate in standard day to day server administration activities. Opportunities exist in both MS Windows and UNIX/Linux server administration areas. Spring/Summer 2012. The Voice/Data Network Technology Intern/Co-Op participates in the implementation and support of voice and/or data networking technologies. Join the LOFT Network where you can include your academic and career preferences and receive more customized opportunities. 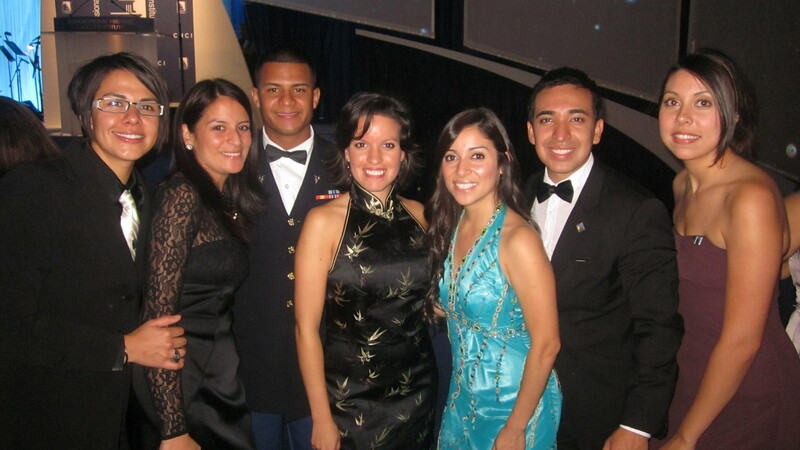 The LOFT Network consists of industry and regional fellows and advisors, former Hispanic Heritage Youth Awards recipients, and participants of other leadership and industry-specific programs. 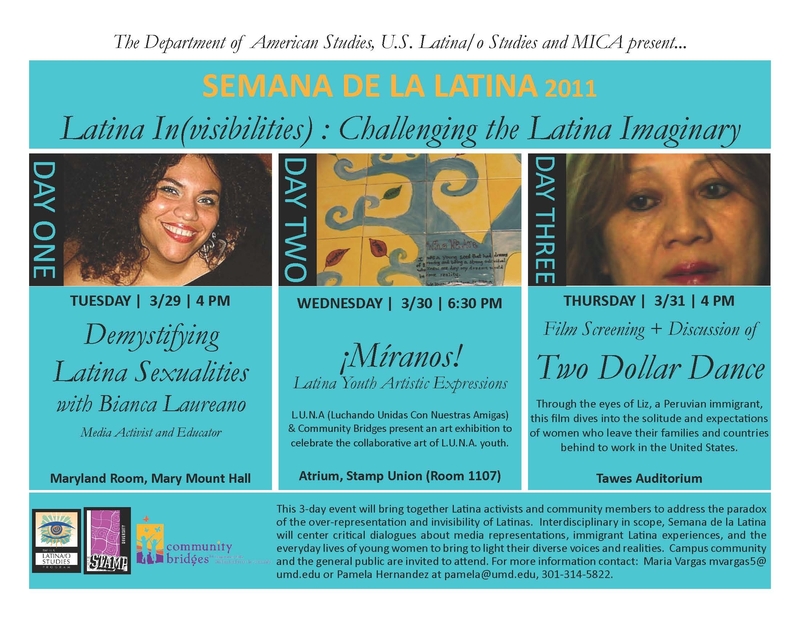 Opportunities available through the LOFT program are for Hispanic students only. Others interested should contact the company website directly. This week we feature the stars of “The Road To Strathmore”, the upcoming documentary of Latino youth dancing their way to the prestigious performance stage at Strathmore. Huge props to Melissa from Clarksburg HS Xtreme Latin dance club and David Cuevas from Einstein’s Titanes Salseros. More details on the premier will be released at a later time. But until then, check out these awesome photos kindly provided by Titanes Salseros’ Paula Pero. For more videos, don’t forget to visit our GL YouTube page. Google is invested in increasing the pipeline of future computer scientists and software developers, particularly those who are historically underrepresented in the field. Many aspiring computer scientists could benefit from a program that bridges the gap between academic study and a professional internship. With this in mind, Google announces the fourth year of the Engineering Practicum internship program [formerly known as BOLD Practicum] for Summer 2012. Engineering Practicum is a full-length, paid, summer software engineering internship. Students work on production-level projects in a team environment, attend training to enhance their technical and professional skills, and receive mentorship from Google engineers. The program is open to all qualified current college sophomores, and is committed to addressing diversity in the field of Computer Science. Students who are a member of a group that is historically underrepresented in the technology industry are encouraged to apply. Please visit www.google.com/jobs/engpracticum for more information and to apply today! The deadline to apply is October 15, 2011. If you have any questions, feel free to contact us at eng-practicum-questions@google.com. Celebrations Continue! This Saturday: Rockville Town Center! Acompananos este Sabado a seguir celebrando nuesta Latinidad en el corazon de Rockville Town Center. Ven a oir los sonidos Latinoamericanos que te van a poner a bailar! 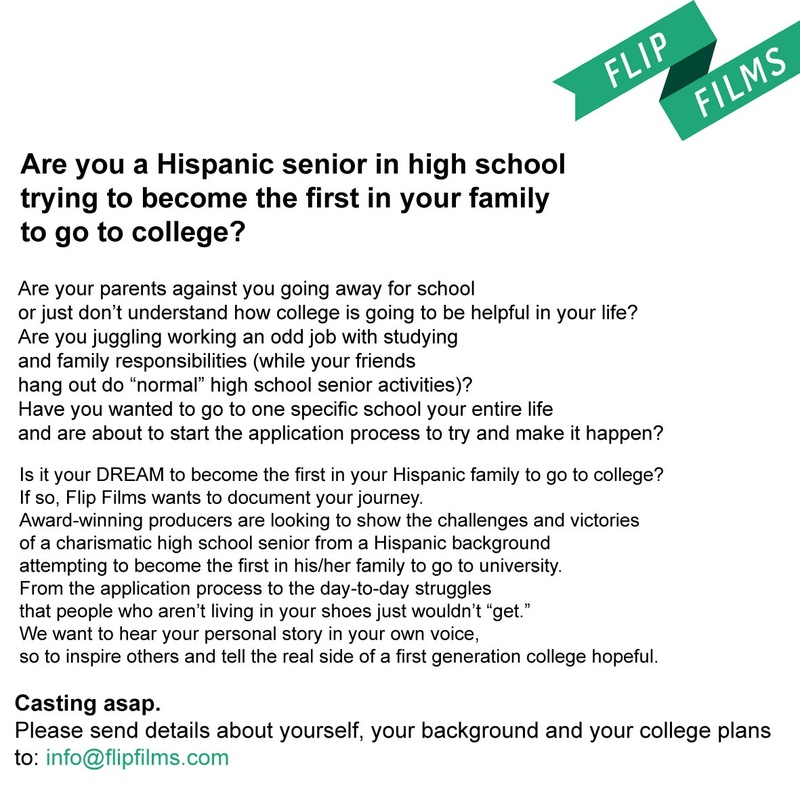 Share your college dreams for a documentary! 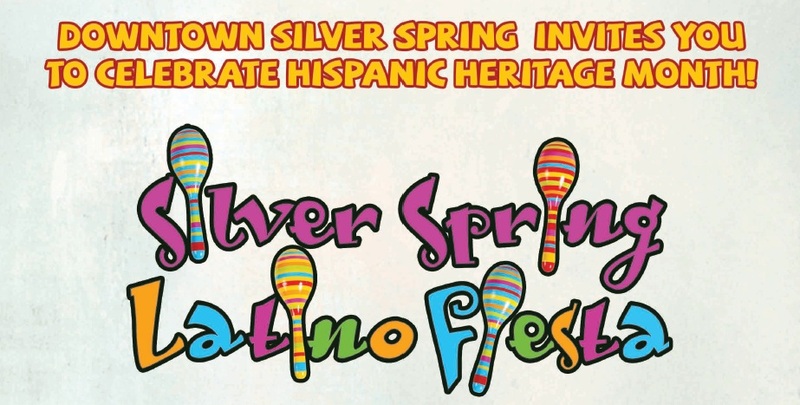 This weekend we hosted the first annual Downtown Silver Spring Latin Fiesta. After kicking it off with Blake High School’s Fuego Latino, we took the fiesta on a whirlwind of Latin music and dance showcasing flamenco with Furia Flamenca, samba with ZeZeh Samba and Samba Trovao, Tinkus Tiataco from Bolivia, Joe King from Puerto Rico and closing it big with DC’s newest Cuban salsa band: Timba Street. What a day! 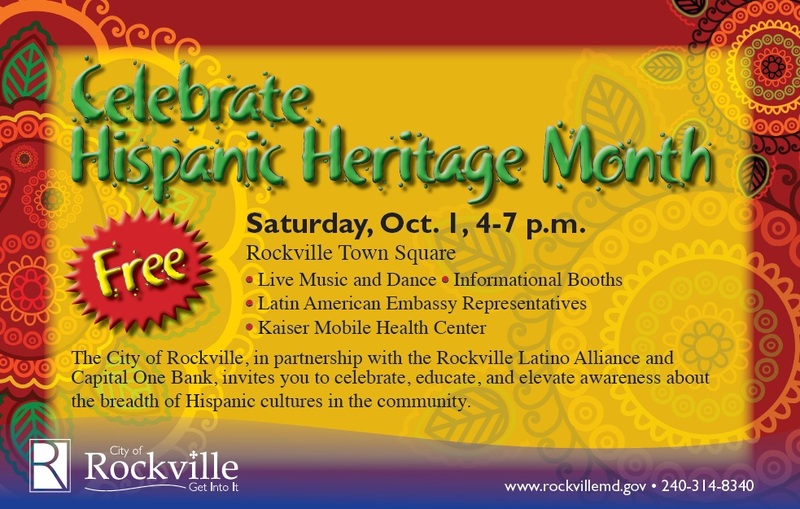 And we are doing it all over again next Saturday October 1st in the heart of Rockville at the Hispanic Heritage Celebration. More details to come at a later post. Stay tuned!! For now, check out the photos on our Facebook page and this short clip produced by our Assistant Producer Intern, Karen. Saturday, September 24. 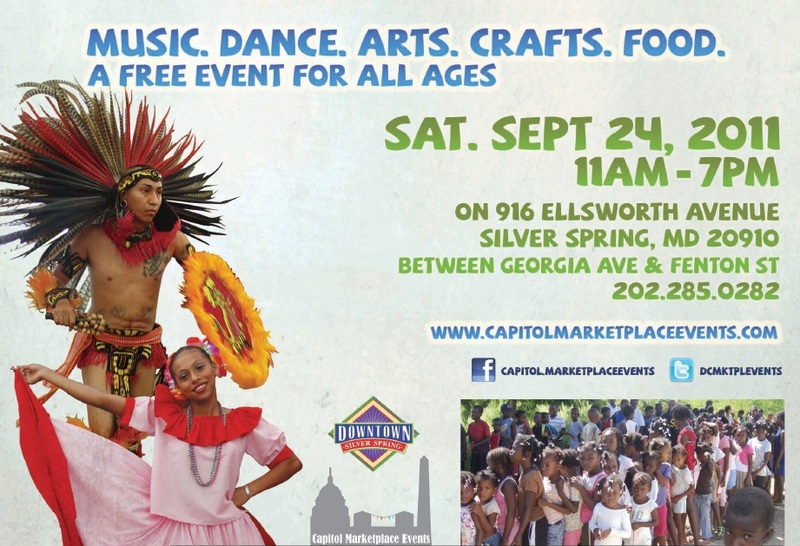 Join us for a vibrant cultural, musical and culinary Latin experience from 11am- 7pm. Festival will feature: Salsa, Flamenco, Zumba, Peruvian folklore, Samba, Tamgo, Latin Rock, Cuban Timba & more! 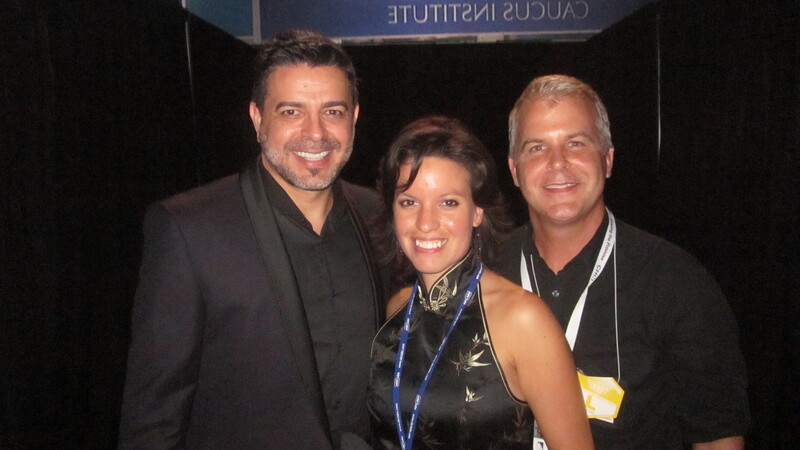 Prince Royce and Luis Enrique joined President Obama, top Latino lawmakers, executives, movers and shakers to kick off Hispanic Heritage month at the Congressional Hispanic Caucus Institute Gala 2011 in Washington, DC. 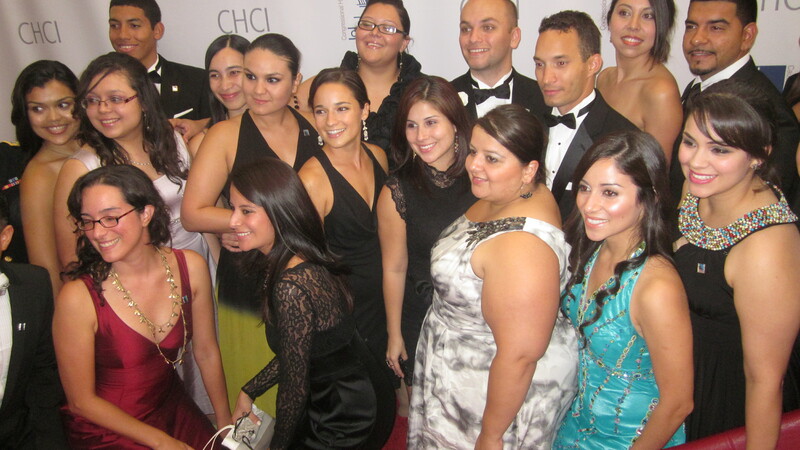 While it was great to meet the celebrities, it was even more inspiring to meet the CHCI fellows- Latino and Latina Master’s and PhD’s to-be- the cream of the crop of our generation pursuing higher education and spending a year in Washington to soak up policy (not just all that red carpet glamour!) to then go back and make a greater impact in their communities. 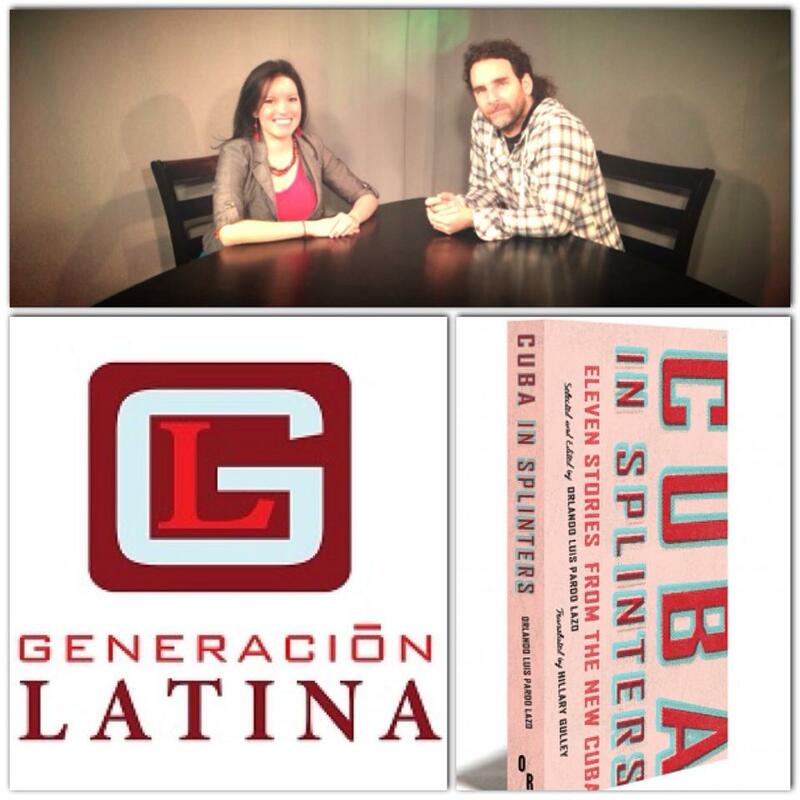 On Tuesday, I had the honor to be on Generacion Latina! We talked about Blake’s Fuego Latino, Hispanic College Fund’s Hispanic Youth Institue, and MCPS’ Student Emerging Leaders Program. Shortly, Roberto Juarez, key-leader of the MD Dream Act movement, came on the set to discuss the Dream Act. I urge all individuals and groups to sign up for the leadership training that will be taking place September 24th and 25th in Baltimore. The vibe that Carolina, Roberto and I created in the studio was BUENISIMA. I am super excited to be an intern and I promise to make myself available to any inquiries Generacion Latina’s followers may have. 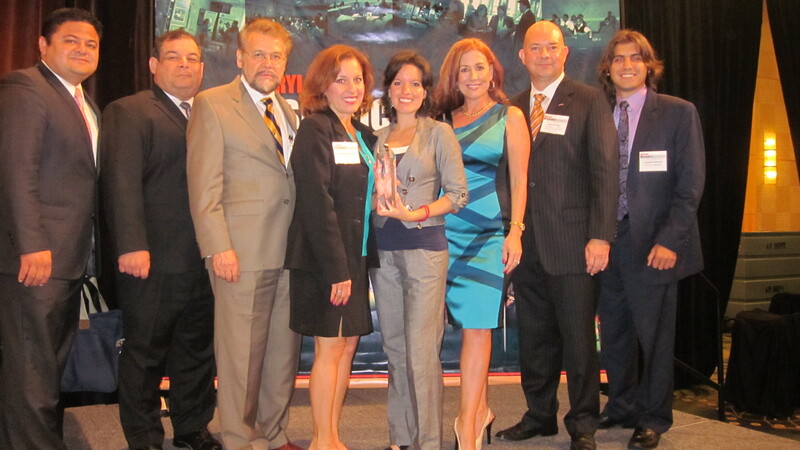 I had the honor of receiving the Maryland Hispanic Business Conference’s Young Entrepreneur Award yesterday. 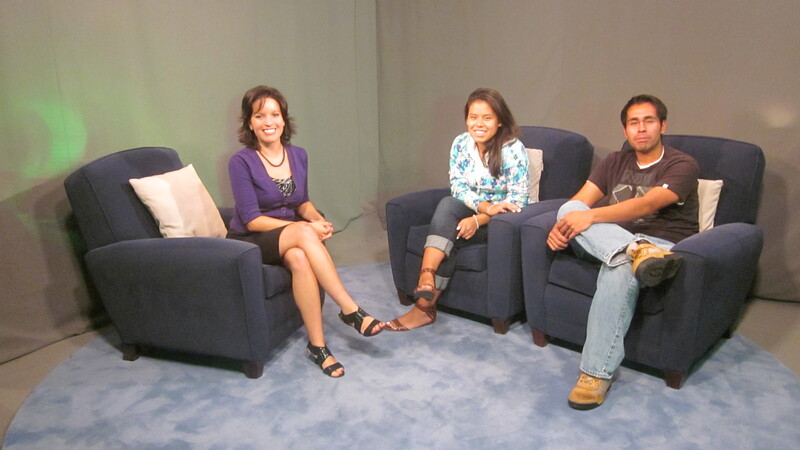 From left: Jeyben Castro, recent guest on GL; J.R. Gonzales, mentor; Charles Vela, my boss; Marta Bohorquez, my amazing madre; Carolina Pena, GL Producer and Host; Lorna Virgili, MDHBC Immediate Past Chair; Jerry Godwin, 2011 Chair-MDHBC; Ezequiel Galeano, my best friend. As I stood before a crowd of 700 plus attendees, one question came to my mind: What if each and every one of these business owners was investing in a young person, spurring them on towards high school or college graduation, and giving them exposure to career experiences? I know that this is no small task! Young Latinos: Who do you know that is a professional, a college graduate, or has a career you are interested in? Ask for their business card and then FOLLOW UP! Professionals: Who do you know that is working hard in school and could learn about what you do and how you came to do it? Give them your business card, please! Now all it takes is reaching out. That doesn’t mean that the next student/professional you meet will be your mentee/mentor. Students, your mentor has to choose you as much as you choose them. Students: reach out and do it often, because you’ll meet and learn from many professionals along the way. Every opportunity you have to meet a professional is a door of opportunity. It is up to you to knock and see if it opens, even if it takes 20 tries! I believe there is a mentor for everyone. If you have a mentor or mentee, we want to know: How did you meet them? What has your experience been like? 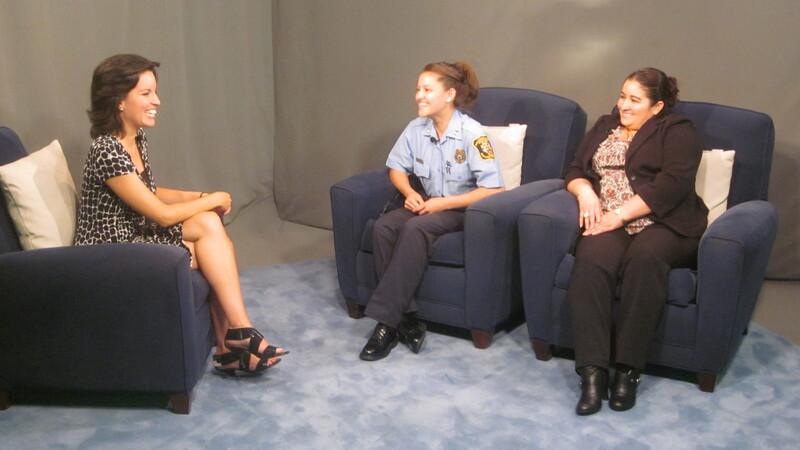 En Generacion Latina esta semana conversamos con Blanca Kling del Departamento de Policia de Montgomery County, Yeni, una joven salvadorena y su mama Hacinda representando al programa de Police Explorers o Exploradores de Policia. Con solo 17 anos, Yeni ha llegado muy lejos en su exploracion profesional aprendiendo liderazgo y toda la practica policial semanalmente. Vale la pena resaltar que la verdadera heroina es Hacinda, un verdadero ejemplo de una madre soltera que lucha por el exito de su hija sin importar los retos. Conozcan a Elisa. Durante su asignacion en Costa Rica como voluntaria del Cuerpo de Paz, Elisa sigue rompiendo barreras. Julian is a recent college grad from California but unlike many grads, he did not wait till after he got his diploma to stand out. Early on, he pursued his passion in education and activism. Little did he know that by taking leadership on campus he would be recruited to work for the White House Initiative on Educational Excellence for Hispanics. Watch and listen this young Latino on the move as he gives us examples of leadership and perseverance without forgetting where he comes from. Hispanic Heritage Month is not important. Or is it? Think about it. What if we didn’t have a month to celebrate our cultura here in the United States? This is your chance to speak your mind and maybe even win a few hundred dollar$ while you are at it! Visit NBC’s Hispanic Heritage Month Essay Contest page, check out the rules and follow the submission instructions carefully! Dale! It’s just 1000 words. Don’t think too much and simply get started. Let your thoughts flow and think… why is Hispanic Heritage Month important? Will you be a sophomore or junior in college this Fall 2011? Do you have at least a 3.0 GPA? 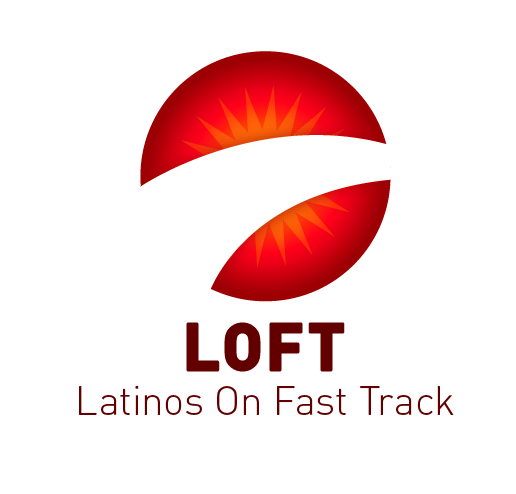 The 2011 LOFT Actionable Leadership Summit aims to train and equip young Latino/Hispanic college students to lead in the face of the most imminent challenges confronting the next generation. Hosted by the Hispanic Heritage Foundation and the Latinos on the Fast Track program, this inaugural gathering will bring together 50 Latino/Hispanic college sophomores and juniors from around the country for a two-day training in Washington, D.C. on September 14th and 15th, 2011. We believe young Latinos possess the intellect, capability, and determination to define a new legacy of leadership and uplift their communities. It is in this spirit we will convene a summit to prepare young Latinos for successful leadership and provide them the opportunity to learn from those who are currently influencing public policy and business in our greater community. Summit participants will attend seminars on relevant policy issues, hear from a select group of experienced leaders from diverse fields, and engage in skill-building workshops focused on communications, fundraising, building networks, and mobilizing others to achieve shared goals. By hosting the summit in conjunction with the Hispanic Heritage Awards and the National Hispanic Leadership Agenda, moreover, we aim to bridge the intergenerational divide between established leaders and those who are preparing to take on the mantle of responsibility. Bringing these groups together around a common purpose – the future of the Latino/Hispanic community in the U.S. – will begin an ongoing conversation which will educate, empower, and elevate the level of discourse around the future of the community. This summit will also catalyze a discussion of national Hispanic issues that need to be raised in the 2012 election cycle and beyond. By expanding out from the “traditional” issue that our community has been pigeon-holed with, i.e. immigration, we can get to the root of the needs of our community right now and the needs of our community moving forward into the future. The issues and topics covered will serve as starting points for engaging with current national leaders and the beginning of a running dialogue for years to come. The 2011 LOFT Actionable Leadership Summit will take place in Washington, D.C. on September 14th and 15th, 2011. The first day students will engage in leadership training, workshops, and issue-based policy conversations with respected national leaders. The second day will begin with visits to elected officials on Capitol Hill and conclude with participants attending the 2011 Hispanic Heritage Awards Ceremony at the Kennedy Center. 1) Fill out this short application. Note you will need to complete this in one sitting, so please plan accordingly. We recommend you preview the application, then copy and paste the short-answer questions (11-13) into a word document. After finishing these on your own, you will be able to go back to the application link and complete it quickly by answering the first 10 questions and pasting in your responses to the short-answer questions (11-13). 2) Send your resume to LatinoLeadershipSummit2011@gmail.com. A strong sample resume can be found here. You must complete these three steps for your application to be considered. The application will close at 3pm EST/12pm PST on Monday, July 25, 2011. All applicants will hear back about their acceptance to the 2011 Leadership Summit between July 29 and August 4. The 2011 LOFT Actionable Leadership Summit application is open to all Latino/Hispanic college students who will be sophomores or juniors in fall 2011. Participants must have at least a 3.0 grade point average. In addition, participants must commit to paying or raising funds for their travel and housing costs, though we will do our best to work with students with limited financial means to ensure costs do not prohibit students from attending. If you do not attend to apply or are not eligible but have an interest in Latino/Hispanic leadership, please fill out our short, 30-second survey on issues important to the Latino community. This will help us as we develop LOFT programming in the future. If you have questions specific to the application or the Leadership Summit, please email LatinoLeadershipSummit2011INFO@gmail.com. For Viviana, it was “love at first sound bite”. But her apparent passion for journalism did not come with it’s set of hurdles. Viviana Hurtado is our first virtual guest on Generacion Latina, but certainly not the first Latina role model to be featured. And the question always comes up: How do successful Latinos make it to the top? Think Sonia Sotomayor, or our own Jonathan Jayes Green! They make it look so easy pero no te equivoques!! In reality they have to overcome their set of hurdles and by their example, they open up the way for us, las nuevas generaciones. In our first virtual interview of more to come, we hear from Viviana Hurtado on a number of topics starting with how she found her path in journalism. You can learn more about Viviana’s insights through her blog The Wise Latina Club. 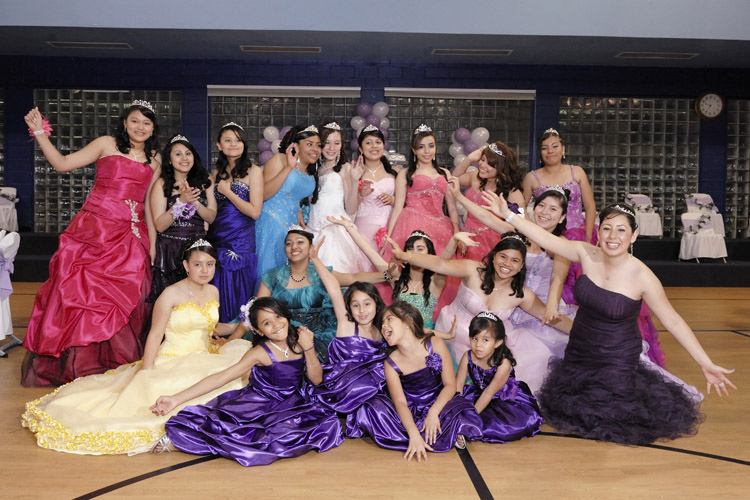 Recientemente tuve la oportunidad de conocer a 16 hermosas Latinas de PG County mientras celebraban su Quinceanera juntas. Todas vestidas como princesas caminaban con un aire de senoritas y ya no como ninas. Acompanadas por sus padres y familias disfrutaron de esta celebracion tipica. Quieren ver como lo disfrutaron? Y lean un articulo escrito en el Pregonero sobre esta noche. Al contrario de muchas fiestas de 15 anos, la jovenes parte del programa “Mis Quince” se comprometen a participar en una serie de talleres para desarrollarse como senoritas enfocadas hacia la universidad y servicio a la comunidad. Lo que muchos no saben es que mientras hay familias que pagan miles de dolares por estas fiestas, las jovencitas del programa “Mis Quince” solo pagan $75 por los talleres y la celebracion (incluso su vestido!). Oportunidades como esta no se dan todos los dias pero cuando si las hay estaremos ahi para informarles. Si desean saber mas sobre el programa y como inscribirse, no duden en contactar a Lourdes Sulc, 301-445-4508 o por correo lourdes.sulc@pgparks.com. Felicidades chicas! Como les dije, su futuro es suyo y ustedes determinaran que tipo de mujeres seran. 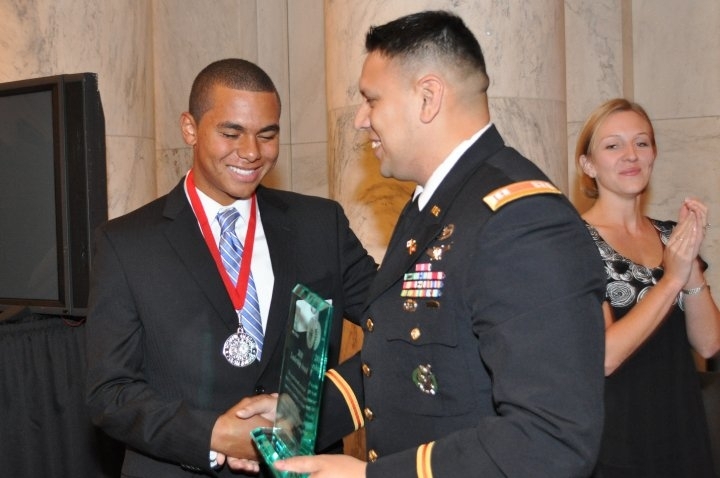 Apply Now for the Hispanic Heritage Youth Awards! DEADLINE EXTENDED!!!! HURRY UP AND FINISH YOUR APP BY JULY 1! The energy, bulla, excitement and nervios could hardly be contained in the halls and auditorium of Dominion High School in Sterling, Virginia today. Latin dance teams from Albert Einstein, Stonewall Jackson, Gaithersburg, Heritage, Gar-field Senior, Dominion, Seneca Valley, Watkins Mill, South Lakes, and Edison High School danced their hearts out while their friends, family and teachers cheered on for hours. Outstanding support from alumni and performances by Sterling Middle School and Harold singing “Nuestra Cultura”. Check out photos and videos of the competition on Generacion Latina – Facebook page and YouTube channel! 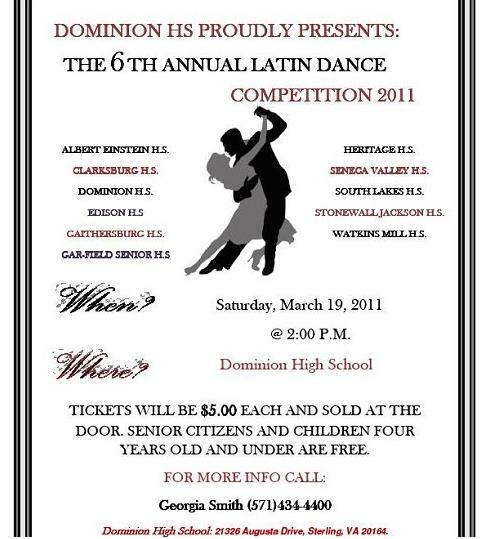 Latin Dance Competition this Saturday! 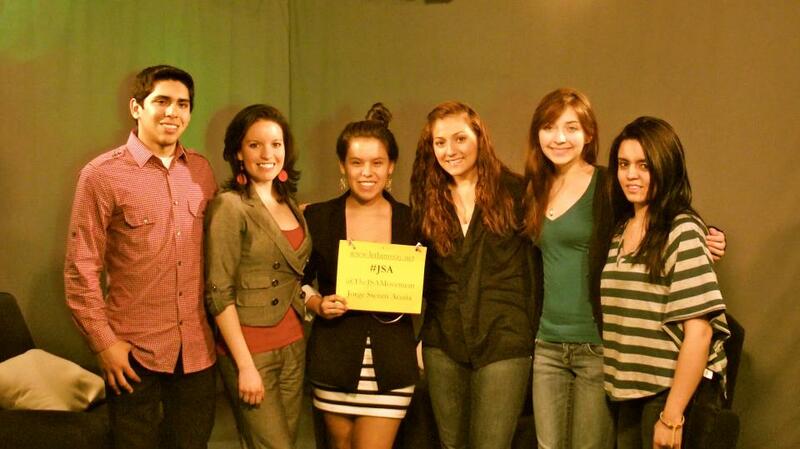 Generacion Latina producer Carolina Pena to host this Saturday’s 6th Annual Latin Dance Competition 2011. For more information, visit the event website! Apply now for the Scholarship for High School Seniors from the Esperanza Fund. This scholarship is open to all immigrant students from the DMV area regardless of ethnicity, national origin or immigrant status. Apply now and spread the word! Ernie G on Generacion Latina! Ever wonder how a new immigrant student can go from knowing no English to interning for a city council member? This week we’ll hear from two students who became fully integrated in our community and took advantage of internships and scholarships thanks to the support of Liberty’s Promise. As you watch the show, I know the word “becas” is sure to catch your interest so don’t miss the last 10 minutes as we’ll hear from Luis Ortiz from Sherwood High School, winner of the National Hispanic Heritage Youth Award in Leadership. $400 Scholarship :: International Students Eligible! The scholarship is available to students in high school and also students currently enrolled in college. You must have a minimum 2.0 GPA, be a U.S. citizen or an international students that is enrolled in school in the USA. You must submit an essay about your academic goals and your contributions to your school and/or community. The Greater Washington Immigration Filmfest is right around the corner! Make sure to save the date and attend the Greater Washington’s first festival showing movies about the hardships of immigration in the United States. Make sure to visit these links to learn more about this event and make a donation! Don’t forget to reserve your tickets! Looking for new Scholarships to pay for the new school year? Well, you are in luck! You can look at these scholarship opportunities and apply for those you get interested! Haz La U Scholarship Program – Opens Fall 2014 (DACA students accepted). Courtesy of Prince George’s County of Public Schools! Carlos Mejia-Ramos: New Student Trustee! 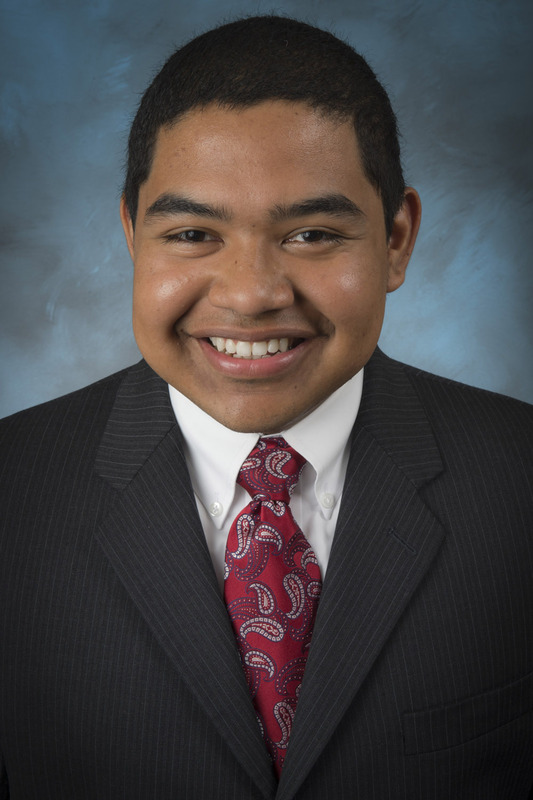 Maryland Governor Martin O’Malley has appointed Carlos Mejia-Ramos to be the new Student Trustee of the Montgomery College Board of Trustees. Mejia-Ramos will serve one year as the student trustee. Mejia-Ramos, of Gaithersburg, is a general studies major at the Rockville Campus and working towards a Political Science degree. The Greater Washington Film Festival is a festival were films about or by immigrants in our community are shown. We need your help to make these films and the festival free! With your help we will be able to fill community auditoriums and theaters in Maryland, Virginia, and DC for three days (October 24, 25, and 26). Make sure to check our the “perks” to the right of the website that you can obtain in return for donating for this cause! Let’s make this festival a reality for everyone! The Governor’s Office of Community Initiatives (GOCI) is offering an internship opportunity for the summer to help the Ethnic Commissions to achieve the goals and initiatives at the time of the application. Skills necessary for the job include: event planning, community outreach, research, data collection, website upkeep, interviewing, and note-taking. Proficient writing skills are a must! The offices are located at 301 S. Preston Street, Baltimore,MD 21201. The offices are accessible via Light Rail and bus. This is an unpaid internship. GOCI is willing to partner with colleges, universities, and other programs to offer credit, a policy analysis opportunity, and/or leadership evaluation. Applications are accepted on a rolling basis, and should include a cover letter, resume and writing sample. Applicants will be contacted within one week of the application materials. Should you have any questions, call (410) 767-2937. 2014 FIFA World Cup in Brazil! SOCCER FANS! You have been waiting expectantly for four years, and the day has finally come! Don’t miss a world-wide event by following every soccer match of the World Cup. Support your team or just enjoy a special time with family and friends by getting together and watching the games. You can watch every game with Spanish commentaries on Univision. You can also watch the games on ESPN. Enjoy this month! It only comes once every four years!